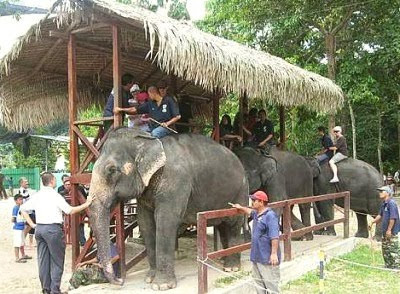 LANCHANG (Pahang): Visitors to the National Elephant Conservation Centre in Kuala Gandah near here will find better facilities once upgrading works on the premises is completed. In the queue: Visitors waiting for their turns to ride an elephant. 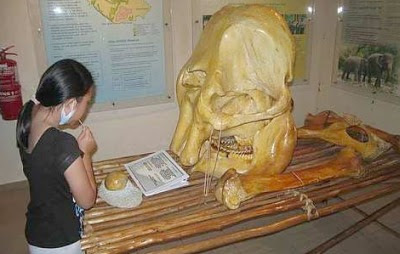 Elephant expo: A visitor taking a close look at a replica of elephant bones. Easy does it: A visitor mounting an elephant in the river while others wait for their turns. The centre’s deputy chief Ahmad Kamsul Alias said the project cost about RM3mil. “Work started late last year and is expected to be completed by the middle of next year. “There will be a new tourist information centre complete with an auditorium for 120 people and a mini museum. “Other facilities include a food court and ample parking space,” he told The Star in an interview. Ahmad Kamsul said the elephant activities area had been shifted to a bigger site. He said that visitors could enjoy elephant rides as well as feeding and bathing with the elephants in a more conducive environment. “There are many rest areas and huts for visitors and their families to enjoy a picnic while watching elephants go by. “We hope people will see the beauty of these animals,” he added. Ahmad Kamsul said, in the first six months of this year, 80,000 people visited the centre which mission was to train and relocate wild elephants. He said that, last year, there were 143,000 visitors compared to 81,000 in 2007, of whom between 25% and 30% were foreigners. “We expect to record a high of 180,000 visitors by December this year,” he said, adding that a maximum of 120 visitors were allowed to participate in activities with elephants in a single day to prevent them from getting stressed. Ahmad Kamsul said the centre had 17 elephants of which four were males. He said the oldest were two 70-year-olds nicknamed Mek Bunga and Lokimala while the youngest was one-year-old Langsat rescued from the forest in Gua Musang, Kelantan, early this year. “We have relocated four elephants, two to a zoo in Johor and two others to Sungai Ketiar, Terengganu. “Our centre has 40 employees working in shifts to look after the elephants. Local residents are engaged to clean the premises regularly,” he said. The centre is the base for the elephant relocation team which began the elephant translocation programme in 1974. It is fully funded by the Wildlife and National Parks Department with an annual grant of RM700,000. It also receives public donations. Its main task is to locate and subdue elephants in areas where their habitats have been encroached and translocate them to suitable sites such as Taman Negara. The centre is open from 10am to 5pm daily for public visits but activities with elephants begin only after 2pm.